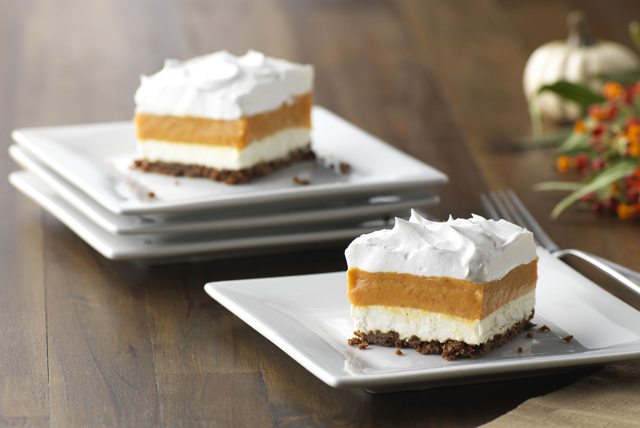 Sweeten up your day with this Layered Pumpkin-Gingersnap Dessert. This Layered Pumpkin-Gingersnap Dessert includes vanilla pudding, pumpkin and COOL WHIP. Combine gingersnap crumbs and butter; press onto bottom of 13x9-inch dish. Freeze 10 min. Beat cream cheese, sugar and 2 Tbsp. milk in large bowl with mixer until blended. Add 1-1/4 cups COOL WHIP; mix well. Spread onto crust. Whisk pumpkin, dry pudding mixes, spice and remaining milk 2 min. (Mixture will be thick.) Spread over cream cheese layer. Refrigerate 4 hours or until firm. Top with remaining COOL WHIP before serving. This is the perfect dessert for your Thanksgiving potluck. Since it serves 24, one batch goes a long way! Garnish each serving with a toasted PLANTERS Pecan Half just before serving.